The statement was issued following claims by the Irish Times this morning that the first termination under the provisions of the Act was carried out at the National Maternity Hospital. THE DEPARTMENT OF Health has issued a statement to advise that the Protection of Life During Pregnancy Bill 2013 has not yet commenced. Although it was signed into law by President Michael D Higgins on 30 July, there are operational issues which need to be addressed before it can be commenced. According to the Department, a panel of medical practitioners needs to be established for the purpose of the formal medical review provisions and administrative facilities have to be put in place to allow for the review committee to perform its functions. The HSE is working to address these gaps with the Department adding that it “will be commenced as soon as is practicable”. 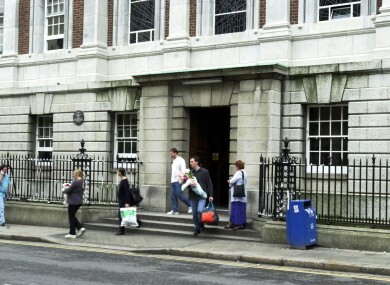 The newspaper reported that doctors at the Holles Street hospital performed the procedure under section 7 of the act which deals with the risk of loss of life of a woman from a physical condition. However, the Department has confirmed this is not the case. Ireland’s Constitution and Medical Council guidelines allowed doctors terminate pregnancies in cases where the woman’s life was at risk before the introduction of the Protection of Life During Pregnancy Act. Clinical Director at the hospital Dr Peter Boylan told Morning Ireland earlier today that patients will always be given the best possible care. “Patients will get the care they deserve and we will not let any woman die in Holles Street. We will give her the appropriate care,” he said. The obstetrician voiced his anger of what he described was an ‘outrageous breach of patient confidentiality’. An investigation has started to discover the source of the leaked information. “It is absolutely unacceptable for patient details to be splashed around the front page of the newspaper,” he said. Email “Department of Health says abortion laws have not yet commenced”. Feedback on “Department of Health says abortion laws have not yet commenced”.